We offer our patented Fleece Flipper™ system OR our Cagetopia® Cage Liners for soft, comfortable, washable bedding for your guinea pigs, hedgehogs and rabbits. Poos must still be brushed up daily, but the urine wicks through to the absorbent layers underneath the porous fleece. Our Flippers and Liners are designed to fit standard-size C&C Cages as well as the Midwest Cage. All other commercial cages are well under the recommended 7.5 square feet of cage space and we do not encourage their use. Fleece is not a good solution for small cages. Fleece Flippers vs. Cagetopia Cage Liners? It's a matter of personal preference and lifestyle. Modular. If one area is dirty, just wash the one case and liner. Taut surface for easier poo brushing or mini-vacuuming. Flip or move panels around if lightly soiled, extending the time between washings. Burrowers can't get under the flippers. Extended use: replace, extend, change the look or downsize independently and easily and affordably. Multi-purpose: Fleece Flipper Cases can be used for a variety of purposes, even potty pads. Easier to wash and dry: Separate smaller pieces and separate liners are easier on your washing machine and much faster to dry than large, single piece liners. Easier: when cleaning the whole cage, it can be easier for some to roll the whole liner up and shake it off, than disassembling and reassembling the Fleece Flippers. No gaps: No possibility of poos getting between Flipper panels. Forgiving fit: For non-standard, DIY cages that may not have been cut to standard specs, the liners are cut a bit large to allow for future shrinkage, so there is more forgiveness of fit. This Fleece Flipper™ set is designed to fit the RECESSED ramp narrow upper loft available on our cages store. This Fleece Flipper™ fits our larger Piggy Party Patio (from the Cages Store). Single Flippers to mix and match fabric combos. Price breaks on quantities! This Fleece Flipper™ set is designed to fit the RECESSED ramp wide upper loft available on our cages store. 1 Large & 1 Smaller Fleece Flipper™ for Wide Loft (NOT LOOP)These Fleece Flippers are designed specifically for our wide (2x2 grid) UPPER LOFT with one recessed ramp. These WILL NOT fit the Wide Loft LOOP, which has two recessed ramps. We offer the Wide Loft Loop Cage Liner for that item. Fleece Bedding for the Lookout Lounge from Guinea Pig Cages Store. 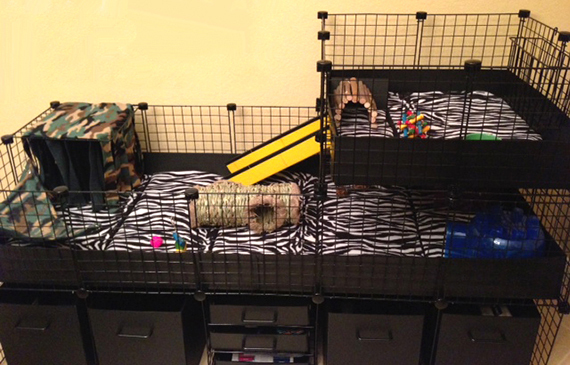 Fleece Bedding for the Midwest Mezzanine from Guinea Pig Cages Store. This cage shows our XL (2x5 grids) cage with a Wide Loft on our Cage Stand with Cubbies and Drawers for supply storage--all available on our sister store. This Cagetopia® setup also features our Fleece Flippers, showing a set of 5 Flippers on the bottom and a special Flipper set for the Wide Loft on top which accomodates our special recessed ramp entrance. You'll note the Fleece Forest in the back, left corner and a Corner Hammock in the front left corner.